At the top of the list is the ALIENPIX-RS. It's a conceptual multi-rotational luminaire based on designs by an Italian manufacturer in the ‘80s. 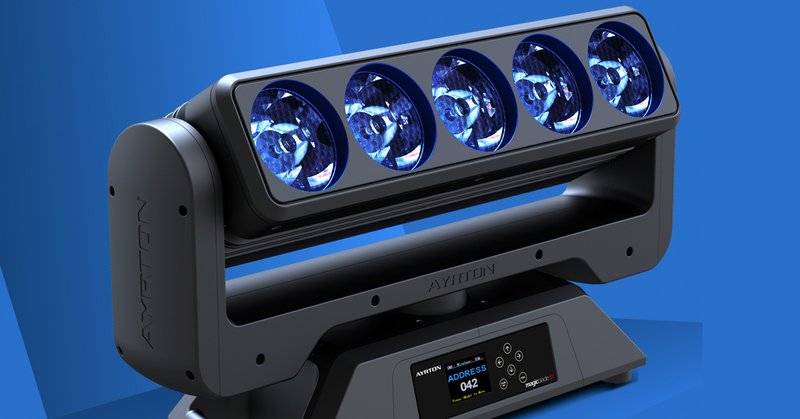 Being a member of AYRTON’s new “RS” product line, ALIENPIX™RS has a powerful 3.5° beam with a centre-beam luminous intensity of over 180 candelas per lumen. ALIENPIX™RS offers several control modes to suit the user’s preferences and programming constraints. Basic mode provides access to a library of pre-programmed effects. In Extended mode, the user can access all functionalities and control each LED separately. 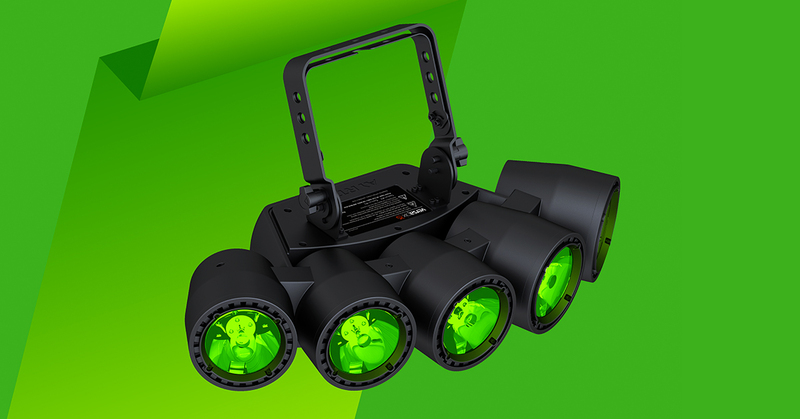 ALIENPIX™RS has series connectivity and can be driven by DMX-RDM, Art-Net™ or a wireless DMX-RDM link via a new-generation TiMo module from LumenRadio™. ALIENPIX™RS allows you to create revolutionary new volumetric 3D effects. The only limit is your imagination! WILDSUN™S25 is the full colour variation on the powerful WILDSUN™K25 luminaire. 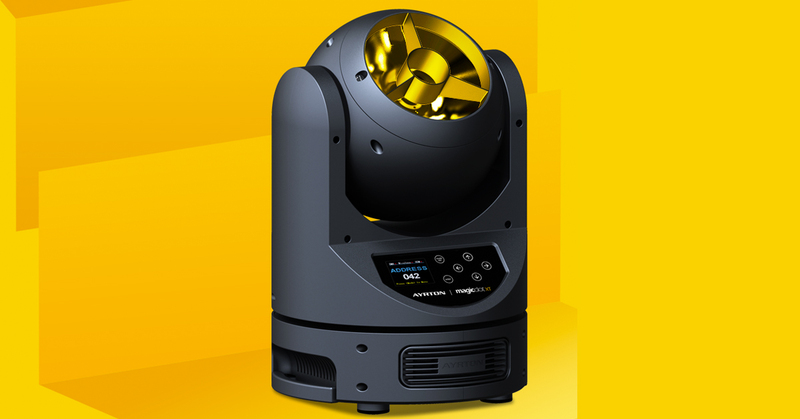 Equipped with 217 ultra-powerful RGBW mono-chip LED emitters, this technologically innovative marvel is the most powerful moving-head LED wash fixture on the market today.With overall light output of 60,000 lumen, it rivals the 2,500 and 4,000 Watt HMI luminaires fitted with colour filters, but with far greater flexibility of use and lower maintenance. Its four-colour mixing is based on an ingenious arrangement of emitters combined with a holographic filter, which creates an infinite palette of pastels and saturated colours. LED emitters are distributed over six 60° segments. Colours in each 36-diode segment can be controlled individually. The proprietary, silicone-based, high-output 6:1 optical zoom ensures perfect colour stability over time, with a zoom range of 10° to 60°. The transmitting lens is equipped with an integrated honeycomb “egg crate” louver to prevent unwanted off-axis glare.Powerful tri-phase stepper motors drive the pan and tilt axes to allow fast, accurate and silent positioning. WILDSUN™S25 is equipped with serial connectivity and can be controlled using DMX-RDM, ArtNet™, sACN or wireless CRMX TiMo RDM from LumenRadio™. 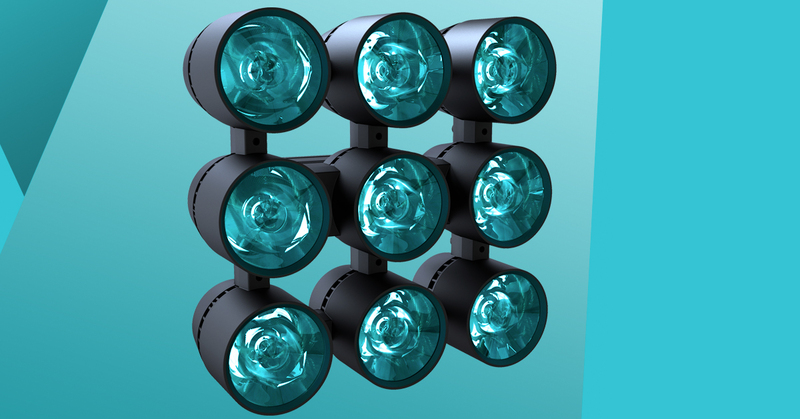 MAGICDOT™SX is an optically evolved, multipurpose, variant of MAGICDOT™R, with the same form factor, dimensions and features, including ultra-rapid beam movement and continuous, unlimited, rotation on pan and tilt. The compact footprint allows multiple MAGICDOT™SX luminaires to be installed with a minimum amount of space between them (patent pending).This new luminaire replaces the 4.5° fixed-focus optics with a revolutionary new 8:1 optical zoom that has a fixed transmitting lens, no visible moving parts and a incredible zoom range of 5° to 40° (patent pending).The short stroke of the zoom system permits MAGICDOT™SX to switch from intense Beam mode to sweeping Wash mode virtually instantaneously. MAGICDOT™XT is a radical variant of the revolutionary MAGICDOT™R. It is fitted with the AYRTON’s new and proprietary 126 mm diameter optic – which distinguishes the “XT” product line. Weighing in at 550 grammes, this new high-efficiency lens is the world’s largest collimator!Combined with an ultra-powerful, low-etendue, RGBW multichip LED emitter, MAGICDOT™XT pushes the limits of technology even further with a 2° full beam and centre-beam luminous intensity of 580 candelas per lumen – six times greater efficiency than MAGICDOT™R. With an active phase-change liquid cooling system that employs a heat pipe, this luminaire can be used continuously without significant loss of output. 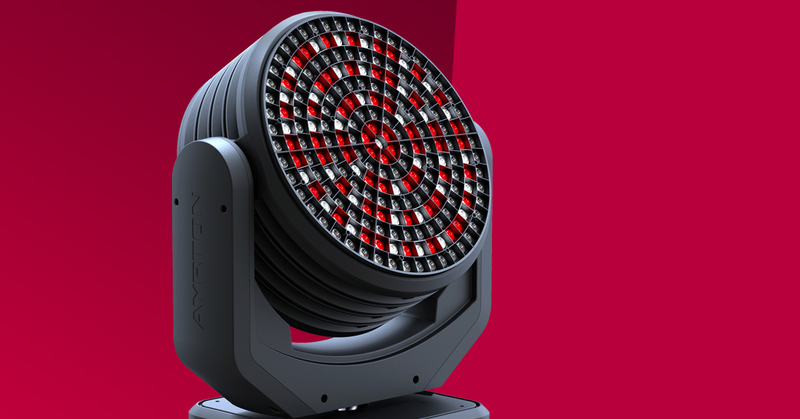 MAGICBURST™ is the first high-power graphic LED strobe with continuous, unlimited, rotation on pan and tilt. A 384 x 384 mm squared face supports 3,840 high-output LED grouped into 64 pixels on an 8 x 8 matrix (patent pending). The strobe duration, speed and intensity of each 60 LED pixel can be individually controlled to create breathtaking stroboscopic effects.A library of fixed images and pre-programmed dynamic effects are accessible from fixture memory. With a new, state-of-the-art, ultra-compact 1,300 Watt power supply, MAGICBURST™ can deliver peak light output of over 240,000 lumen for several seconds. 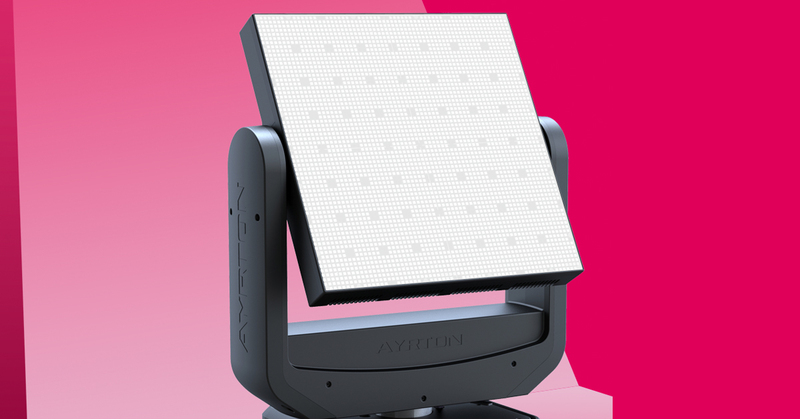 With a minimalist design and reduced visual footprint, MAGICBURST™ is similar to the form factor of the DREAMPANEL™ product family, which allows you to create giant graphic arrays with no visible structure.The standardized size of the LED matrix permits hybrid screens to be assembled, to allow you to use different units from the AYRTON™ product family in combination. 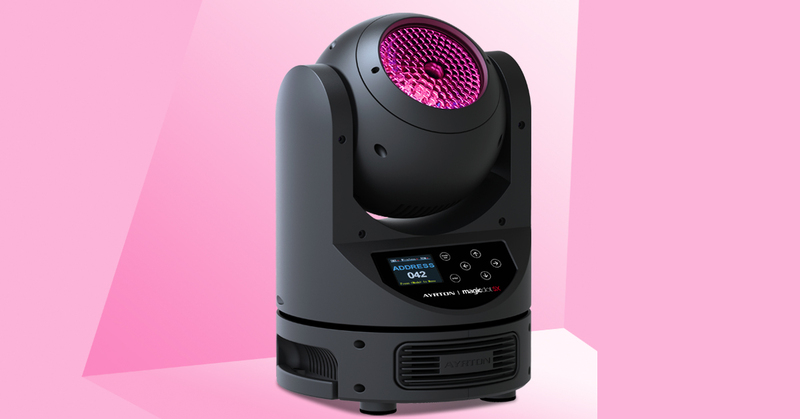 MAGICBURST™ has extended serial connectivity and can be controlled via DMX-RDM, ArtNet™, sACN or a wireless link using CRMX TiMo RDM from LumenRadio™. VERSAPIX™, a contraction of versatile and pixel, is a veritable fan of light. Brilliantly evolved from the VERSAPIX™100 concept first introduced in 2012, the VERSAPIX™RS is the first in the new ultra-radical “RS” product series. A new 40 Watt reduced-scale multi-chip RGBW LED emitter has been combined with innovative 94 mm diameter high-efficiency optics.Once again pushing the limits, this luminaire can generate an ultra-powerful 3.5° beam with a record-breaking centre-beam intensity of 200 candela per lumen. With three times more power and six times more centre-beam intensity, the VERSAPIX™RS offers infinite possibilities for creating 3D volumetric lighting effects regardless of the ambient light conditions. Because of its configuration and power, the VERSAPIX™RS required the development of a specific new cooling system for each of the emitters that evacuates the air at the edges of the optics while preventing haze and dust contamination (patent pending). The VERSAPIX™RS, the most mobile of the fixed luminaires, was designed to be modular, with five emitters in a fan-shaped 90° arrangement, enabling independent control of each of the emitters. This offers a range of installation possibilities, such as combining the luminaires to create complex shapes (disks, spheres, cylinders, etc.) or using individual luminaires in a variety of architectural configurations. With the VERSAPIX™RS, your imagination is the limit. MAGICPANEL™FX is the exciting new multi-function, multi-use luminaire descended from the renowned MAGICPANEL™R (patent pending). With a revolutionary new optical zoom system that has no visible moving parts and a stationary transmitting lens, this proprietary system has a 15:1 zoom ratio with a range of 3.5° to 52°. The front face of MAGICPANEL™FX is comprised of a 5 x 5 array of squared lenses with perfectly isolated emitters – which offer exciting new possibilities for creating 2D graphical effects. Each of the 25 squared 65 mm output lenses have an optical surface equivalent to that of an 80 mm round lens, combined with an ultra-powerful, low-etendue, LED emitter. MAGICPANEL™FX produces an extremely powerful beam capable of creating extraordinarily new 3D volumetric effects. With 900 Watt of total power, the versatile MAGICPANEL™FX has 25 next-generation RGBW high-power LED emitters and an active phase-change liquid cooling system using a heat pipe for intensive use in “wash light” mode. The continuous, unlimited, rotation on pan and tilt, first introduced on the legendary MAGICPANEL™602 in 2013, is standard. MAGICPANEL™FX has serial connectivity and can be controlled using DMX-RDM, ArtNet™, sACN or wireless CRMX TiMo RDM by LumenRadio™. MAGICBLADE™SX is an advanced variant on the award winning MAGICBLADE™R luminaire, which has been sold by thousands, worldwide, over the last two years. The versatile new MAGICBLADE™SX features astate-of-the-art short-stroke zoom with a 10:1 ratio for a wide zoom range from 4° to 40°.The zoom has no visible moving parts and is fronted by a 94 mm-diameter fixed frontal lens – so MAGICBLADE™SX generates five fat beams that zoom to increase the visual impact of light that appears and disappears when programming volumetric 3D effects (patent pending). Five next-generation RGBW high-output LED emitters power MAGICBLADE™SX. Each can be controlled separately to create virtual lighting scenes or to highlight architectural structures on stage. A library ofpre-programmed dynamic effects, stored in fixture memory, can be combined with different display modes and colour macros. MAGICBLADE™SX is equipped with extended serial connectivity and can be controlled via DMX-RDM, ArtNet™, sACN or a wireless link using CRMX TiMo RDM from LumenRadio™. 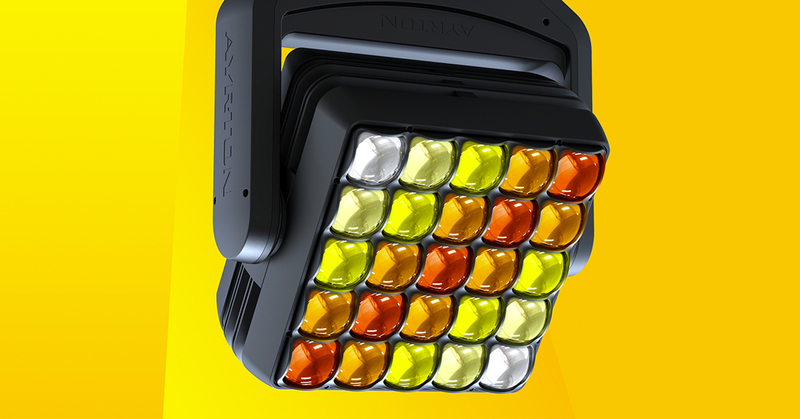 INTELLIPIX™XT is a refined and evolved version of AYRTON’s original INTELLIPIX™R. 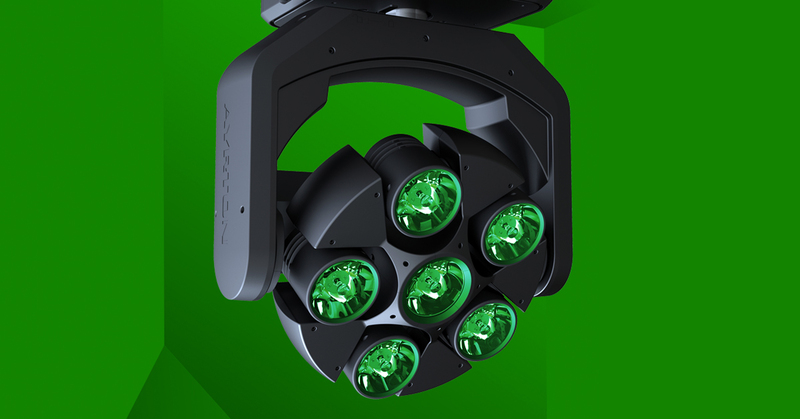 In the same creative spirit, this versatile luminaire is fitted with nine ultra-powerful, low-etendue, multichip LED emitters, which can be controlled individually and are coupled with AYRTON’s new proprietary 126 mm diameter optics.This configuration pushes the limits even further with a 2° full beam and a centre-beam luminous intensity of 580 candelas per lumen – six times greater efficiency than its predecessor. INTELLIPIX™XT has a next-generation power supply unit that ensures efficiency over 95%. This technology enables the highly compact luminaire to run continuously at full power without any loss of performance. In light of the diameter of the optics, AYRTON’s challenge was to create a minimalist physical design to reduce the visual footprint, essentially making the luminaire semi-transparent.With a highly precise coupling accessory, multiple INTELLIPIX™XT luminaires can be perfectly positioned in order to create large-dimension 3D volumetric lighting effects. A highly adjustable yoke system enables the luminaire to be used individually to generate complex assembled shapes. 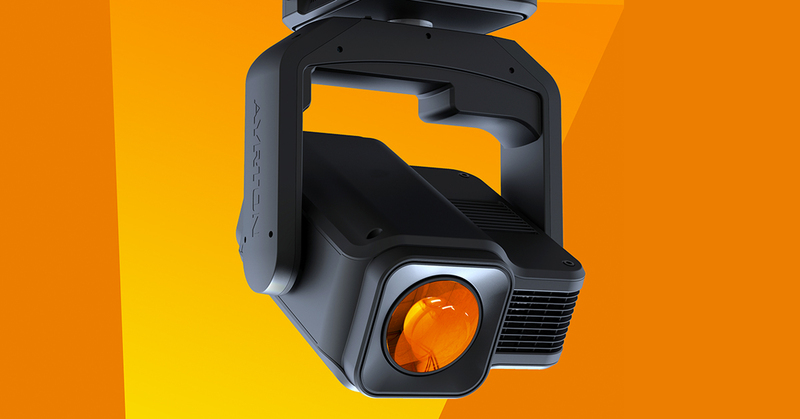 After the 2003 launch of EYECOLOR™, the first available professional moving head LED projector on the market, AYRTON™ is proud to introduce DREAMSPOT™18K, the very first laser-source multifunctional, multiple-use automated luminaire. Fitted with an OSRAM™ Laser PHASER™ P6000 phosphor conversion module that required three years of development and rigorous testing, DREAMSPOT™18K will offer lighting designers an unlimited range of creative possibilities.The monochrome laser emitter module calibrated at 5,600K enables the luminaire to achieve 18,000 lumen of power. Its 13-element optical zoom system can obtain a highly uniform fat beam with no hot spots, providing a zoom range of 2° to 34° in Beam mode and 6° to 54° in Spot mode. DREAMSPOT™18K is the first multifunctional moving head spot unit capable of continuous rotation on pan and tilt. Equipped with a CMY subtractive colour mixing system and a wheel of 13 complementary colours, including four CTO filters, this luminaire can produce a virtually infinite palette of pastel and saturated colours. The rich assortment of effects, including fixed and rotating gobos, iris diaphragm, dynamic effects wheel, rotating prisms, and diffusion filters, will satisfy a wide variety of needs. For optimum stability, DREAMSPOT™18K is equipped with a highly effective new phase-change liquid cooling system using a heat pipe.